Though these things can seem that way, my decision to go vegan didn’t happen overnight. To be honest, I estimate that it took me a couple years to get to where I am today. I had to educate myself about a lot of things, not all of them easy to accept, and do quite a bit of leaning into a plant-based lifestyle before I was ready to make the commitment. And it certainly helped to know that, once I took that leap, there would be an abundance of delicious, nourishing food on the other side. So, in the spirit of abundance, I’ve gathered together several of my favorite plant-based recipes that I developed over the past couple years. 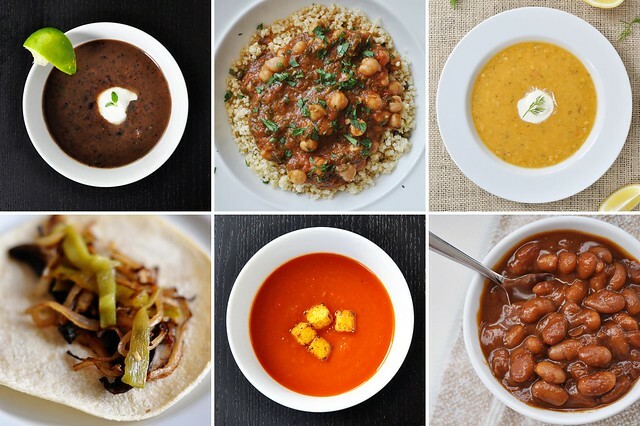 These recipes are sure to satisfy–whether you already have a full-on vegan kitchen or are simply looking to lean. P.S. Maybe this is obvious, but make sure to choose veggie stock when I’ve given you the choice between that or something animal-based, and omit cheese or other dairy-based garnishes (or choose vegan substitutions if you like). Thank you for sharing some of your favorites. I will definitely be trying these! And I LOVE your expression of ‘looking to lean’. That is exactly where I am at. Looking to lean and see where it leads. I can’t wait to try the portabello tacos!